Hows about a slightly different salad? 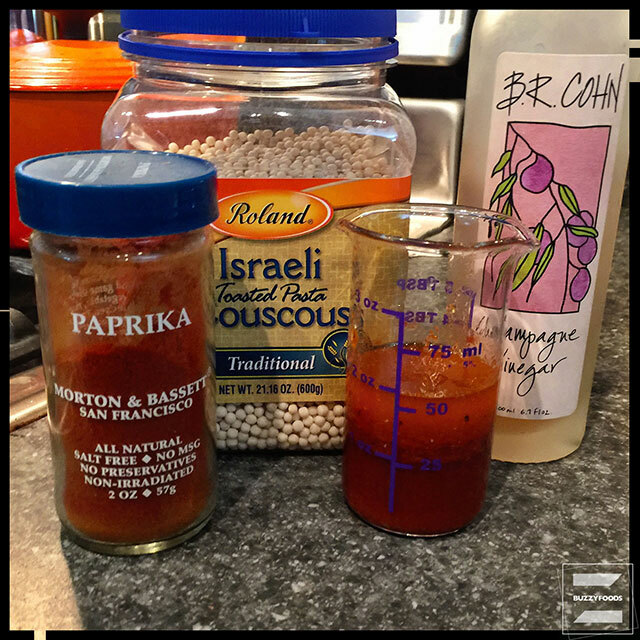 This version calls for lightly toasted Israeli “Pearl” couscous, which is bigger than the more regular couscous, and is served with veggies, a light vinaigrette, a bit of cheese, and, because I prefer it that way, a dab o’ home made French dressing. The first time I made this salad, I added sliced peperoncini, this time, I substituted hot pickled cherry peppers with very good results. 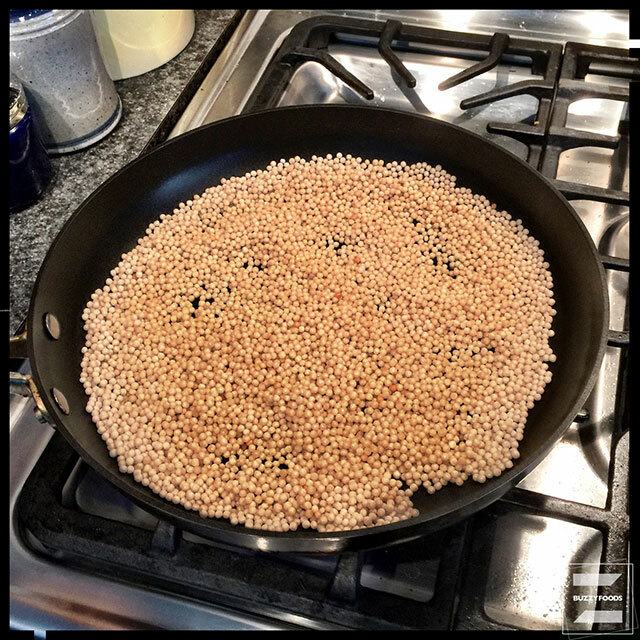 Heat the tablespoon of olive oil in a large pan over medium-high heat, then add the couscous and cook, stirring often, until the couscous is lightly browned – about seven minutes. Add the stock and the sea salt and bring to a boil. Reduce the heat, cover, and simmer until the liquid is mostly absorbed – ten minutes should do it. Set aside to cool, and don’t worry about a bit of extra liquid in the bottom of the pan. 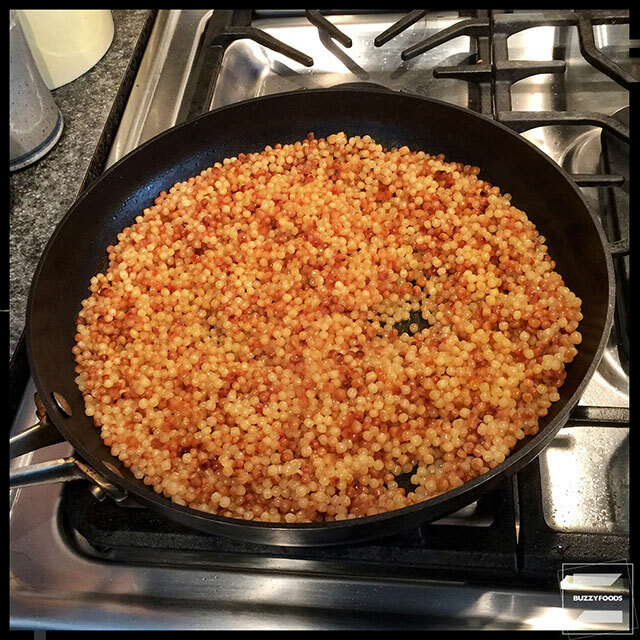 Make the basic dressing by whisking together the olive oil, vinegar, paprika, sea salt, and pepper in a small bowl (I used my immersion blender), then add it to the cooled couscous. Stash in the fridge for a few hours to chill. 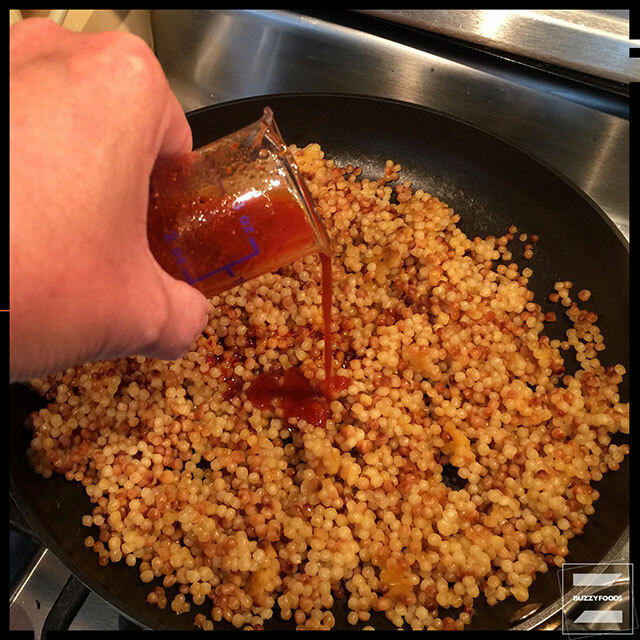 This rest will allow the flavors to blend, AND allow the couscous to absorb any extra liquid (and flavor) left over from cooking or from the dressing. Give it a taste and see what you think. I though it nice, but in need of a little sumpin’ sumpin’, so I grabbed a jar of Tante Marie’s French dressing from the fridge, added a couple of tablespoons, and gave it all one more toss. 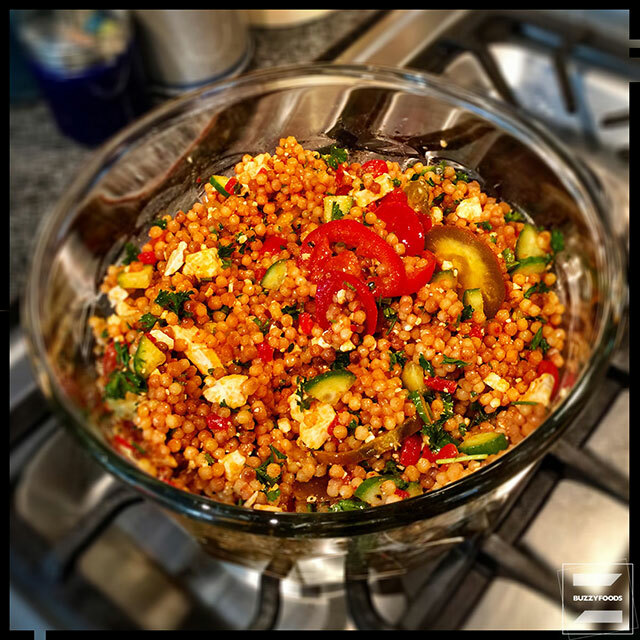 With the couscous nicely dressed and chilled, I added the tomatoes, cucumber, parsley, cheese, and peppers, then tossed to mix. When ready to serve, squeeze a wedge of lemon over the salad, give a final toss, and serve over baby spinach leaves or shredded romaine. 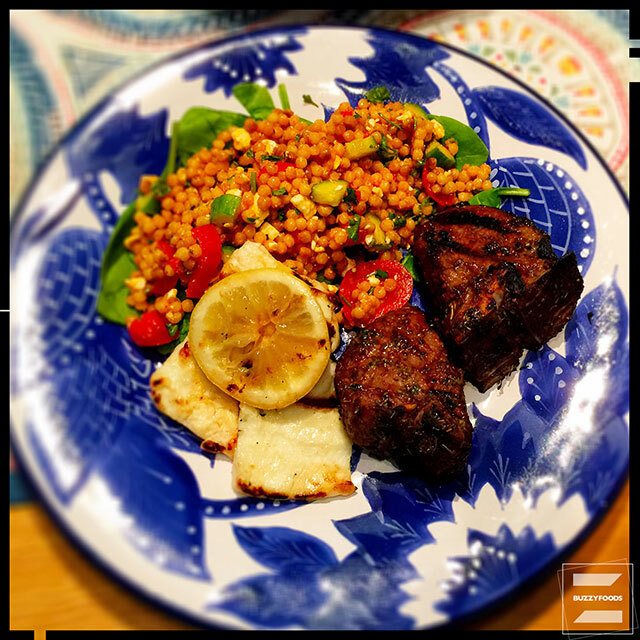 We enjoyed ours with grilled marinated lamb chops with grilled halloumi and lemon on the side. 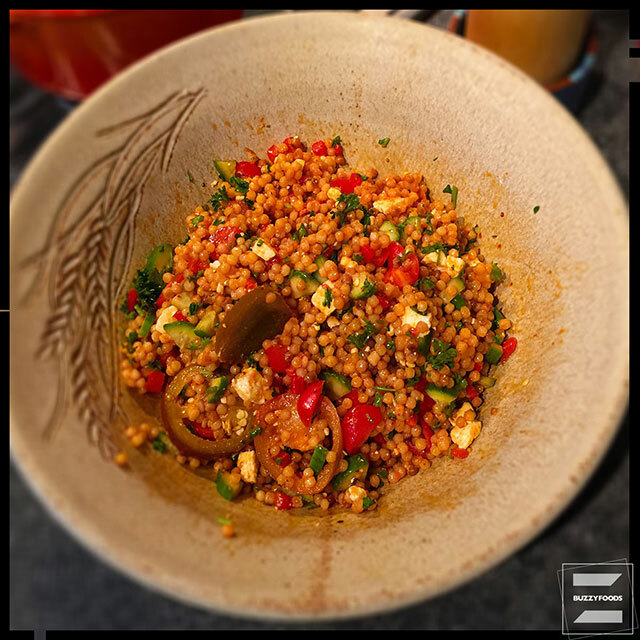 This entry was posted in Salad and tagged Couscous, Couscous Salad, Cucumber, Feta Cheese, Israeli Couscous, Parfait!, Pearl Couscous, salad, tomato. Bookmark the permalink.